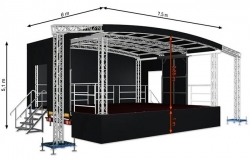 This is just basically the smaller version of our popular Large profile Trailer Stage that has been impressing audiences all over the country. 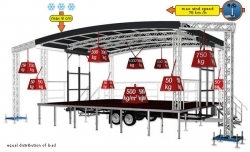 As with the larger version we can supply disabled/loading ramps,PA tables and extra stage area whether it be to the side,front or rear of the stage. As you can see there are plenty of hanging points for lighting and sound equipment which we now supply with all our stages if required. Please contact one of the team who will be happy to answer your questions.